Join us for a cocktail evening on the top floor of beautiful cSpace. Enjoy local food and drinks, and spend your evening learning more about how your clothes were made, and chatting with other fashion revolutionaries! There will be music, Fashion Revolution activities, a #whomademyclothes photobooth (perfect to get the perfect picture to upload on Instagram and tag your favourite brand! ), and of course, great people. Local designer Caroline Forde has curated an art gallery in the space, featuring the work of incredible local artists who've created pieces around the theme of sustainability and ethics. The Fashion Revolution YYC team knows that community is essential to change the world. We created this event around the idea of connection + education. You’ll be able to talk one-on-one with fashion industry experts, sustainability enthusiasts, and local business owners, and have the opportunity to ask them any questions. Connect with fellow fashion revolutionaries through activities, good food, and even better conversations. 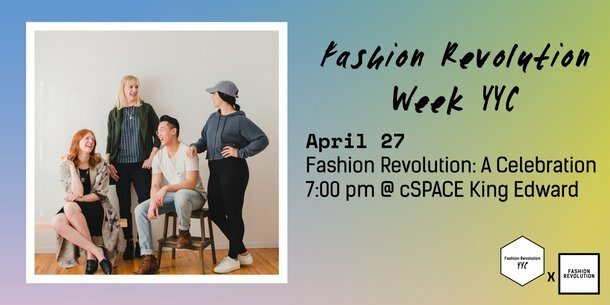 7:30: Hear from the Fashion Revolution Week YYC team. 7:45: Introductions to the professionals, business owners, and passionate people who are there for you to ask questions to, and discuss ethics and sustainability! This event is $20 online and $25 at the door. It includes an alcoholic drink ticket, light snacks, and a chance to win an awesome raffle prize. This event is not-for-profit, and all ticket sales will go towards event costs for the evening/week. *Vegan food will be available, including cupcakes generously donated by Baked From the Heart. We want this event to be as accessible to everyone. If you cannot afford the ticket price, please send an email to fashrevyyc@gmail.com, and we'll make sure you're on the list.